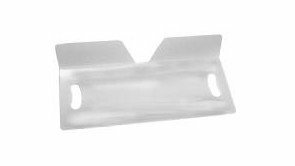 The AttenuTech® Butterfly Transfer Board has a raised portion on the backside of the board to help prevent the user from sliding off the back of the transfer board. The raise section provides the user and caregiver with added security and safety during the transfer process. The AttenuTech® Butterfly Transfer Board is used to bridge the gap between two transfer points. The board is made of flexible plastic and has built-in hand grips at either end to make placement and removal easier. The board is available in two lengths, 23 inches and 30 inches and has a weight capacity of 300 lbs. SST Board is placed under one hip and the patient is then tilted toward the board, taking the weight off the other hip. With the entire weight now resting on the SST Board, the patient can be easily transferred. To remove the SST Board, bend it upward toward the patient and remove by pulling upward. During transfer from a bed to a wheelchair, it is often advantageous to position the wheelchair at a slight angle to the bed, so that the wheel is not in the way of the transfer. It is better if the bed is slightly higher than the seat of the wheelchair. This allows a downward transfer. The most common procedure is for the patient to sit on the edge of the bed and then slide across to the wheelchair on the transfer board. When transferring a patient between a wheelchair and a toilet or commode two facts should be kept in mind. Bare damp skin does not always slide on the transfer board. A towel, toilet paper, or transfer slide placed under the patients buttocks will solve this problem. Another option is to remove the patient’s lower garments after the transfer has been made. Since there is only a small area of contact between the transfer board and the toilet seat, it is advisable to make sure that the transfer board is kept firmly in position, by holding it, to prevent slipping. During a wheelchair to vehicle transfer, the transfer board functions best if you work from inside the vehicle by pulling the patient towards you. In the case of a totally passive patient, a AttenuTech® Transfer Sling (Model 3011) and AttenuTech® Transfer Belt may be used in addition to the transfer board. This makes if easier for the caregiver to pull the patient into the vehicle. It is also more comfortable for the patient.